Now in his fifth season at Borussia Mönchengladbach, Thorgan Hazard is already a key player for his club - and starting to become one for his country. bundesliga.com takes a closer look at the 25-year-old’s steady progress, which has led to him playing alongside older brother Eden for Belgium and exceeding him for creativity in 2018/19. Not long after Hazard signed on loan for Gladbach, then-Foals manager Lucien Favre – now in charge of Borussia Dortmund – explained how the club had sought his opinion on the player in the summer of 2014. “He was proposed to me while I was on holidays,” Favre told Belgian broadcaster RTBF. “I watched on YouTube because I didn’t have the choice, and I didn’t want to watch too many DVDs of Zulte Waregem. Watch: We met Thorgan Hazard back in 2014 and took a look at his roots! It proved a shrewd assessment. With former footballers for parents and older brother Eden blazing a trail at Chelsea, Hazard had already demonstrated that he would add to the family legend. Aged 21 when he signed for Gladbach, by then the talented attacking midfielder had already been turning heads in the Belgian Pro League. Part of a Zulte squad that included now sadly deceased former Wolfsburg midfielder Junior Malanda, he had led the unfancied West Flanders club to within minutes of a first league title in 2012/13. Hazard followed up by winning the Soulier d’Or - an award given to the best player in Belgium in a calendar year – at the end of 2013. Five months later, after registering 14 goals and 15 assists in 2013/14, his fellow professionals named him the league’s player of the season – beating former Dortmund striker Michy Batshuayi to the prize. Favre warned that Hazard still had work to do, and the Belgian’s first season at BORUSSIA-PARK was one of transition. He made seven starts and 21 substitute appearances in the Bundesliga, but three goals in nine UEFA Europa League matches suggested that the Foals had a serious talent on their hands. 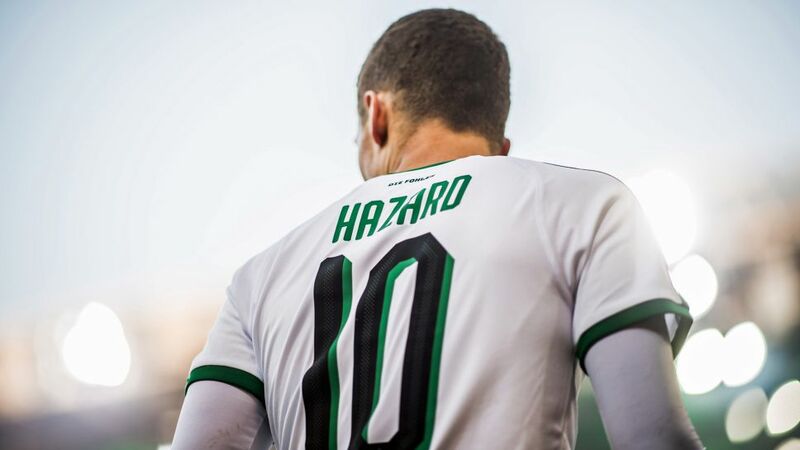 Gladbach sporting director Max Eberl certainly thought so, praising Hazard’s “exemplary development” as the five-time German champions made the player’s move from Chelsea a permanent one in February 2015. Since then, the tricky attacker’s form has continued on an upward curve. Six goals in all competitions in 2015/16, 11 a year later, and 10 in the Bundesliga – as well as seven assists – in 2017/18. In the first half of last season, the La Louviere native became the first Gladbach player to be directly involved in a goal in nine consecutive league matches since data collection began. Those kind of numbers made Hazard an obvious choice for Belgium’s 23-man squad for the 2018 FIFA World Cup. “In my club, my status has changed,” he told RTBF by way of explanation for his call-up in May. “I’ve put in good performances and I’ve had a full season. Having played twice as Belgium finished third at the World Cup, Hazard now seems ready to star for a side that currently sit level at the top of the world rankings alongside France. Both Hazard brothers got on the scoresheet in a 4-0 World Cup qualifying win over Cyprus in October 2017, and the pair were at it again in a friendly against Scotland this September. It must be hard for Hazard to keep pace with an older sibling who was voted the seventh-best player in the world for 2018, but Thorgan is more than managing that in 2018/19. He boasts a combined 15 goals and assists for Gladbach in 13 games in all competitions, while Eden has three fewer in 14 for Chelsea. Their combined powers pose a terrifying prospect for opposition defences. Thorgan made the first goal and Eden netted the second in that 4-0 success for Belgium in Glasgow. He also grabbed a brace in a 5-2 defeat to Switzerland in the UEFA Nations League. All that is good news for Gladbach, who had been adamant that they could ward off interest in last season’s top goalscorer during the summer transfer window. Hazard, who didn’t miss a league game in 2017/18, has been eager to build on that momentum. That fine-tuning seems to be going well. After scoring a hat-trick in the DFB Cup first round in August, Hazard has helped fire Gladbach into second place on the back of seven goals that have been complimented nicely by four further assists. So often compared to his high-achieving older brother, the 25-year-old is now starting to deliver on his own devastating potential.